So now the shearing season is over, we have all those beautiful fleeces. 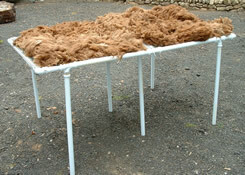 All we need is a good sorting table to help us grade, clean and sort the fibre. We finally found a good set of weighing scales for paddock use. We took paddock maintainence into our own hands at last - for around half what we expected to pay . . . There aren't many books on looking after Alpacas - and the useful ones are even rarer! The two we just couldn't live without are on our Books page. They also have links to Amazon so you can order them online.